May 19, 2018 at 12:10a.m. Photo by David Dermer | Phantoms forward Michael Regush pins Fargo’s Robbie Stucker during Friday’s game at the Covelli Centre. Fargo has a 2-1 series lead and the Phantoms must win tonight to force a Game 5 in North Dakota. 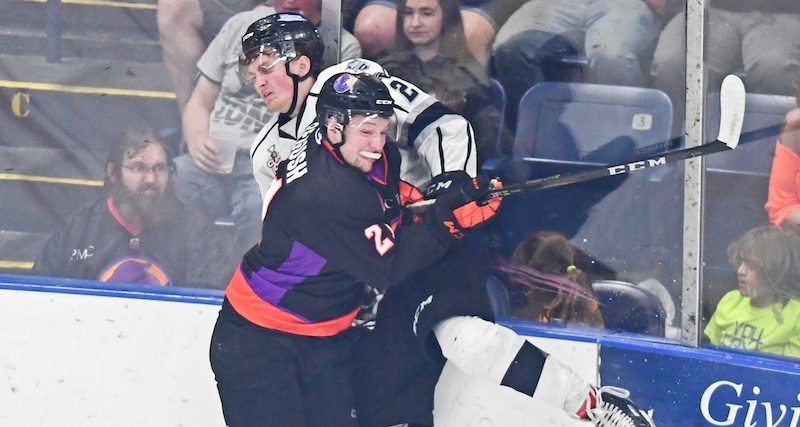 After a very slow start, the Youngstown Phantoms dominated the Fargo Force in round three of their USHL Clark Cup Final. But strong play by Force goaltender Strauss Mann, an extremely fortunate bounce and a clutch third-period goal has the Force one win away from celebrating their first league championship. Strauss stopped 38 shots as the Force defeated the Phantoms 3-2 before a boisterous crowd of more than 3,000 at Covelli Centre. Bartek Bison’s goal with 6:53 remaining was the game-winner. With a 2-1 lead in the best-of-five lead, the Phantoms face their first elimination game of the postseason. Game 4 begins tonight at 7:05. Phantoms captain Eric Esposito called the crowd support “huge. In my three years here, best crowd that I’ve seen. The Phantoms were sluggish early, but came on strong in the second period. Sixty-four seconds after the first intermission, Chase Gresock tied the game 1-1. Matthew Barry set up Gresock’s fifth goal in his last three home games. The Phantoms dominated the period, peppering Mann with the first 10 shots of the frame. Then Nicholas Cardelli, who started the season in Fargo, provoked the loudest cheers when he scored a power-play goal with 6:21 to go in the second period. Esposito and Michael Callahan set it up. But the cheers faded quickly when Force defenseman Evan Bell scored the flukiest goal of the season just six seconds later. Right after Cardelli’s goal, Bell took the puck off the faceoff and fired it into the glass in the Phantoms’ end. The puck hit one of the glass stanchions and ricocheted toward the Phantoms’ goal, slipping past goaltender Ivan Prosvetov who had moved to play a traditional bounce. Asked what happened, Bell replied, “Oh, I couldn’t even tell you. “They just got a big goal on the power-play. I just hard-rimmed it as hard as I could. It hit the stanchion and took a good bounce. Patterson said Prosvetov did nothing wrong by moving out to play the anticipated deflection. Late in the first period, Griffin Loughran put the Force up 1-0 when his shot from the slot beat Prosvetov. Grant Hebert set up Loughran’s seventh goal of the postseason. The Force dominated most of the period, but a late flurry by the Phantoms helped them reduce the shot disadvantage to 12-7. Patterson said he wasn’t surprised that the Phantoms rebounded from the slow start. “We’re a team that gradually get better all the time,” Patterson said. “Love it or hate it, that’s what we are.